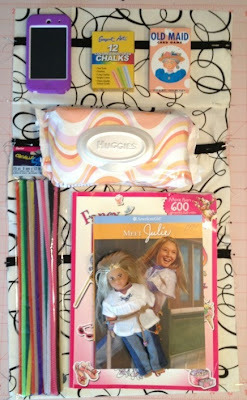 Elle Belle Creative: Car caddy take 2! 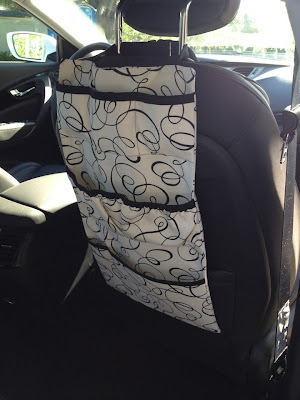 I'm finally revisiting the car caddy I made for the roadtrip series I did. At my initial attempt, I used a tutorial I found online and had fun making it, but it really didn't serve the purpose I had intended. So I completely revamped it and am much happier with the results! I put together this tutorial so you can give it a try for yourself. 2 13''x23" rectangles for the front and back of the caddy. 3 pieces for the pockets - 13"x8", 13"x16", and 17"x10"
Make the pockets by folding and pressing the 3 pocket pieces in half so that you have 2 13" wide rectangles (one is 4" tall and the other is 8" tall) and 1 17" wide by 5" tall rectangle. 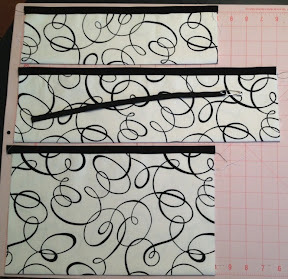 Encase the long raw edges of each pocket piece in the double fold bias tape and sew. Feed the 13" piece of elastic through the pocket made by attaching the bias tape to the 17" x 5" pocket piece, sewing the ends of the elastic to the ends of the pocket piece. 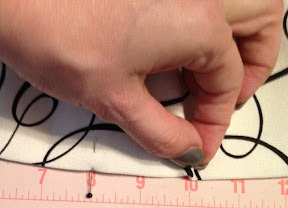 Next we'll make a pleat in the 17" wide pocket piece by marking the center with a pin, then measuring 2" out from the center, pinching and bringing that into the center, pin & repeat with the other side of the fabric from center. 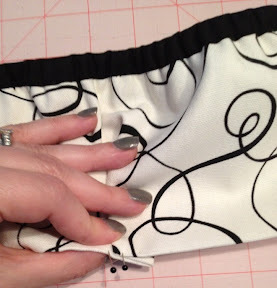 Baste the pleat together & remove your pins. Place the 13"x23" front rectangle face up. Pin the 8" tall pocket piece at the bottom - bottom of the pocket piece even with the bottom of the rectangle. Pin the 5" tall pocket piece (the one you added the elastic and pleat to) 2" above the top of the 8" tall pocket. Pin the 4" tall pocket piece 2" above the top of the 5" tall pocket piece (you should have approximately 2" left at the top of the rectangle). Place the items that you want to store in the caddy on top of the pockets and leaving about a half an inch on each side of the item, mark where the pocket seems should be. For the 4" pocket at the top make 3 pockets approximately 4 1/4" apart. 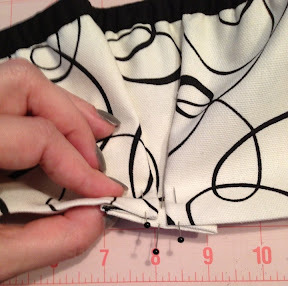 Sew along the bottom of the top two pockets and along your marked lines to create the division in the pockets. Feed one end of the 5" piece of belt strap through one side of the buckle and sew it closed. Feed the other end of the 5" piece of the belt strap through the other adjustable side of the buckle, fold the end over on itself and sew to finish the end. Align the raw edges of the 36" piece of elastic with the raw edges of the bottom of the front rectangle and pin approximately 1/2" above the bottom of the rectangle. Align the raw edges of each of the belt straps (opposite the buckle ends) 2" from the top corners of the front rectangle and pin. 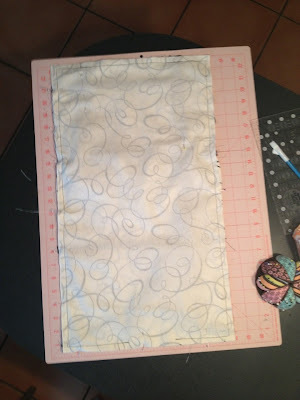 Place the other 13"x23" back rectangle right side down on top of the front rectangle and pin, ensuring the top of each side of each pocket is pinned in place. You may also want to pin the elastic and the buckle pieces into the center of the rectangle so you don't accidently catch them as you sew. With a 1/2" seem allowance, sew all around the rectangle, leaving room at the bottom to turn through. remove the pins and turn the pieces right side out. Press all around and sew the opening you turned through shut. 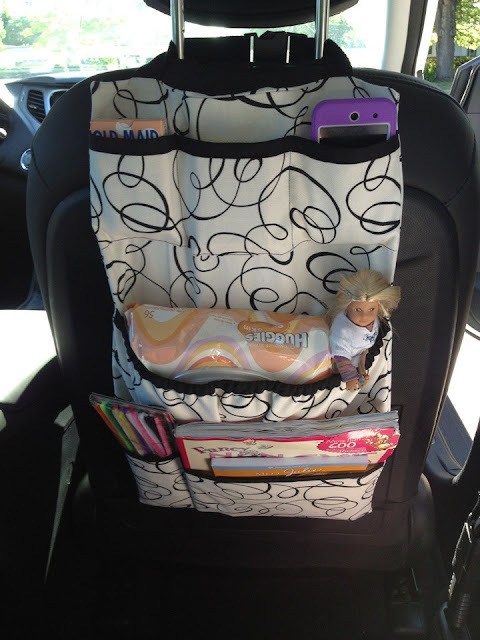 Slide the elastic down over the car seat, buckle the top strap around the head rest and pull tight. Fill with roadtrip goodies! How is it that nobody else has left a comment?! 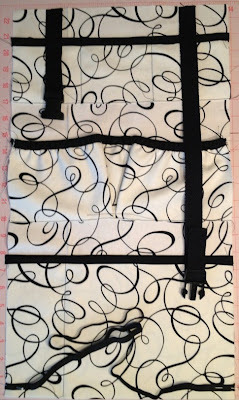 This fabric is gorgeous, and I love the finished look of your design. After holding fabric in my stash for many months, I am inspired to take it out and begin! Thank you for sharing this tutorial. Thanks for this easy to follow tutorial! 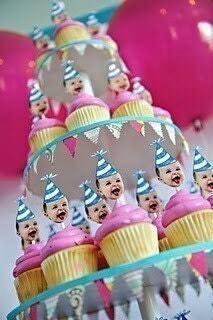 This is is the best one yet! Hi Stacey- thank you for sharing this very clear tutorial! I Love it!! I did it for my daughters. You explain it very well. Thanks from Argentina.